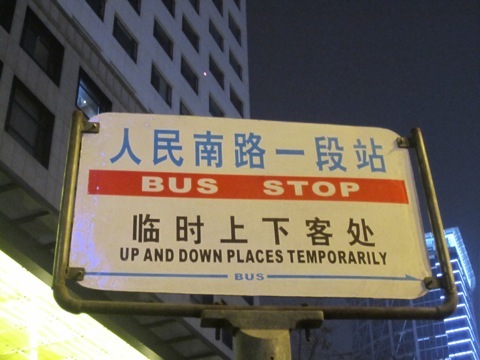 The Craziest Chinglish Out There | Chinglish Alert! In no particular order… Some of the craziest Chinglish I’ve ever seen. If you see a date and place that’s Chinglish I’ve snapped! NOT SAFE FOR WORK! There might be strong, coarse, offensive or obnoxious language from some of the Chinglish posts at times. This is not intended to insult or hurt anyone, but you have been warned! Please do not jump off the platform or get into the orbit. Get on and off the train until the moving train is stabilized. Never jump off the platform or jump onto the tracks. Do not chase trains or get on or off until the train comes to a complete stop. Wait — first is after, is on, or is what-er? Muslim / Halal restaurant. No outside food allowed. Found at the toilets, probably. Thing is: can anyone come out with a female man? So you are saying that quieting is OK. Right? That sounds like an artificial thingamajig! Do I have to pay a congestion charge to use that? Note to self: Use this only when mutilated. You’ve just upset the Irish (Eire). Visitors to Jade Cloud Road should proceed with caution. Super long, and just plain weird. No spaces, either! Peddler… management… landing stage. Stage. Say — an open air café? Cool. I just had a great day. Now let me ruin it by calling n the cops! So you mean I can smoke away at will if I refuse to be fined? DANGER! PRESENCE OF SUPER-DIFFICULT-TO-COMPREHEND CHINGLISH! Yes, it’s that ____ slope.